Set with a row of seven diamonds, this 9ct white gold wedding band offers a contemporary twist with a contrasting matte and polished finish. This captivating piece is perfect as a wedding ring to beautifully commemorate your special day. 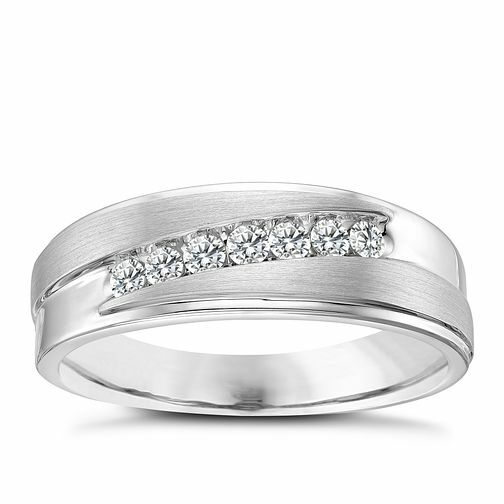 Men's 9ct White Gold 7 Stone 0.25ct Diamond Band is rated 5.0 out of 5 by 1. Rated 5 out of 5 by Anonymous from The Photographs do not do this Ring Justice The Ring is absolutely stunning in every way, Really has the bling thing about it. Upon receiving the ring it was too small however I took I to my local shop and the assistant Helen was fantastic she gave me the advice related to having it stretched and said it was not recommended due to the diamond setting, Helen got more gold added to the Ring as this would be quicker than ordering a bigger size due to the time of year. This was even done free of charge. My Ring was back 4 days sooner than quoted and it fits perfectly, Great job Ernest Jones thanks so much. And thank you Helen.